Having chanced upon some madeleine tins while in Calais in November last year, I returned to London with all the best intentions of churning out try after tray of the tiny delicacies. 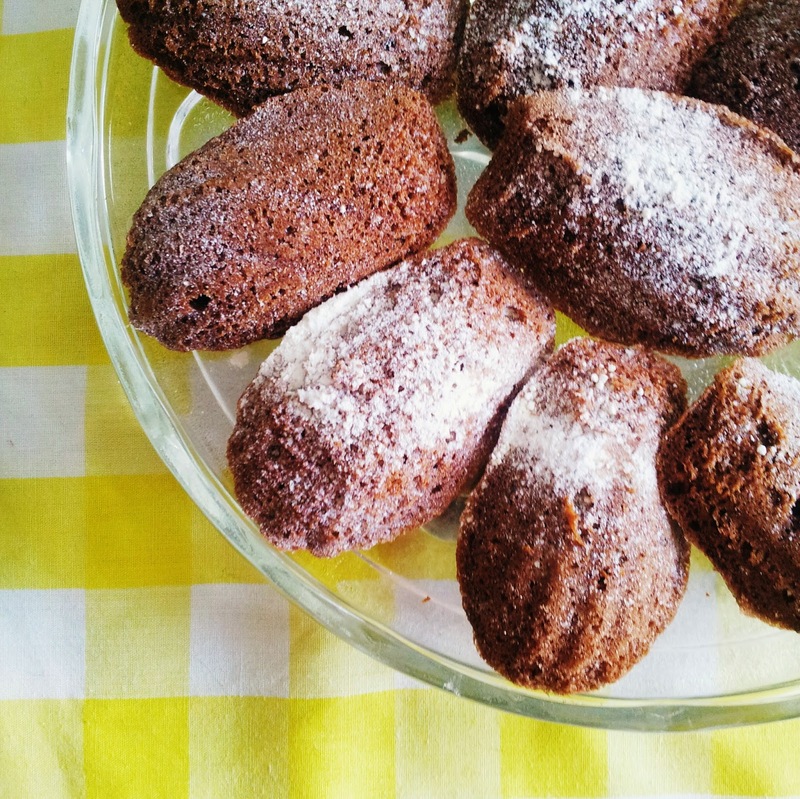 I would be making madeleines every weekend, my kitchen would be filled with edible seashell shapes in all colours of the rainbow, all with different flavours. Best-laid schemes of mice and (wo)men, and all that...and so the tins languished in my kitchen cupboard for the next few months. Anyway, Ari sent me a link to that John Whaite off the GBBO's* recipe for madeleines flavoured with chocolate and coffee. They sounded tasty, and not too complicated. So I gave them a go. He also includes a recipe for a cocoa-flavoured dipping sauce, but I left that out and simply dusted with icing sugar instead. *That's Great British Bake-Off for those of you not au fait with today's yoof slang. - Preheat the oven to 190 degrees C.
- Melt the butter in a saucepan over a medium heat, then set aside. - Put the eggs, sugar and coffee extract into a mixing bowl, and beat with an electric whisk until light and fluffy, and tripled in volume. This should take about 12 -15 mins. - Sift the flour and cocoa powder into the egg mixture, then pour in the butter. Gently fold these into the egg mixture until smooth and silky. - Fill the madeleine moulds about 2/3 full, then bake for 8 - 10 mins or until the madeleines look slightly browned around the ages. Turn them out of the tin as soon as they are baked or they will stick. Lightly dust with icing sugar or cocoa powder (optional).